God Wars: Future Past is a Strategy RPG from Kadokawa Games published by NISA. 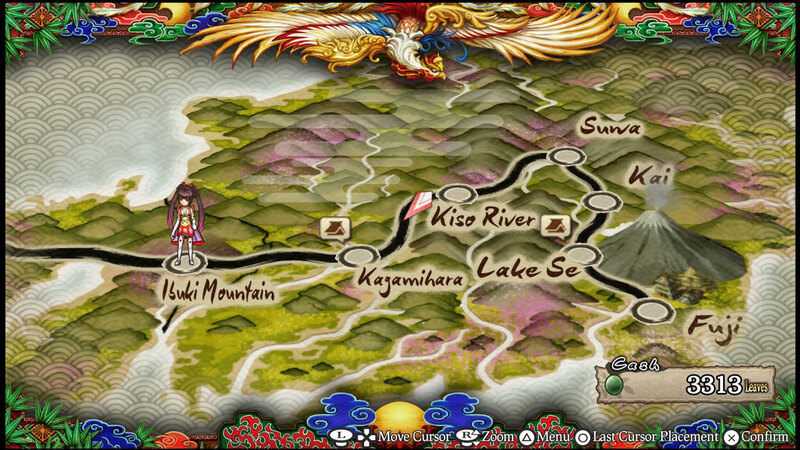 The game takes place in ancient Japan, and includes many elements of Japanese mythology and folklore. Kaguya, a princess of the Fuji province, is the main character. The story starts out with her mother, Queen Tsukuyomi, sacrificing her youngest daughter in Mt. Fuji in order to appease the angered gods. Thirteen years later, the Queen is missing and has had Kaguya imprisoned. A boy named Kintaro manages to free her, and thus begins Kaguya’s search for her mother. The gameplay here is similar to Final Fantasy Tactics, particularly with the job system. You can freely choose what class your characters are. 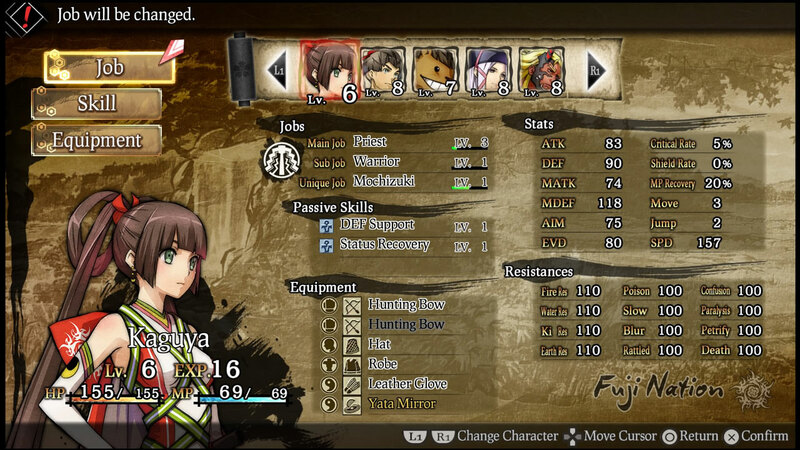 Each character has a main and sub job which you can level up and acquire new abilities. The main job is the most important, as it effects your stats and what you can equip. The sub job just gives you more abilities to work with. Finally, each character has their own job that makes them feel unique, while still allowing for customization. 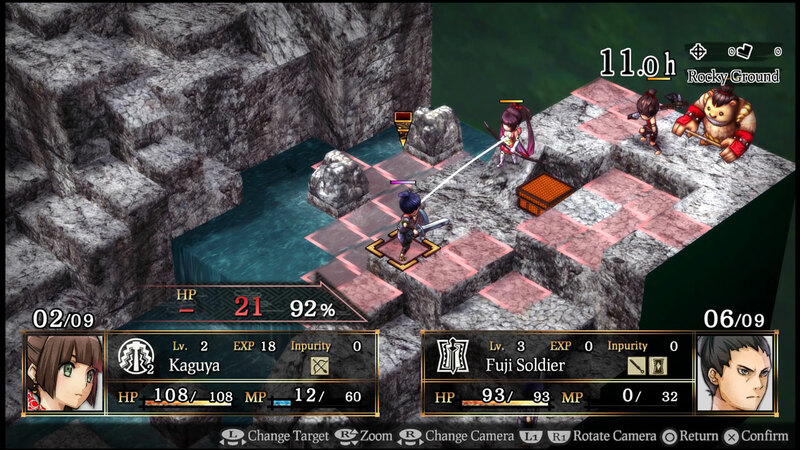 The main character Kaguya gets some unique support and offensive spells. 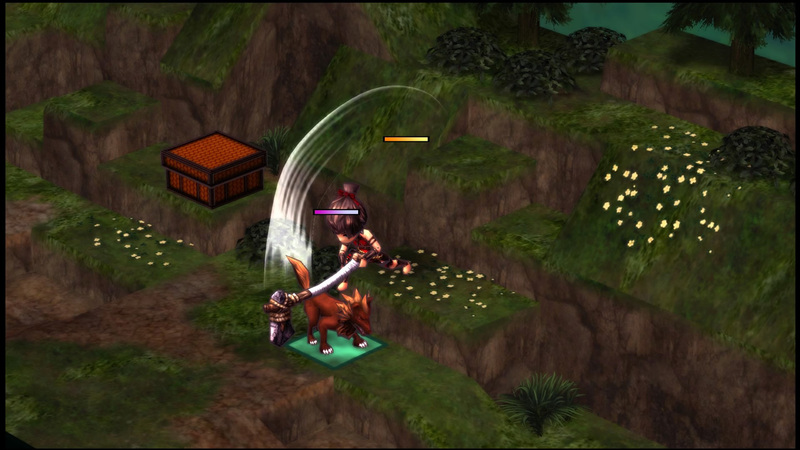 Another character, Kintaro, has a passive ability that increases accuracy with axe weapons. The most unique one I found was a character that could summon monsters as allies. The unique jobs give you an idea of what strengths the character has, so you can build around it. There are three separate job trees, focusing on physical attacking, magic attacking, and support abilities. There’s also three tiers of classes, beginner, intermediate, and advanced. The way you unlock classes is simply by leveling up the class preceding it. There’s no need to put characters in jobs you don’t really want them in just to unlock a certain other class. Overall this system works pretty well, and is quite a bit more balanced than the job system in Final Fantasy Tactics. No wiping out entire maps in one turn here. However, I feel as though it’s a bit less fun and somewhat restrictive. Due to how the jobs are tiered, some are just straight up better than others. Once you have the advanced jobs, there’s little reason to use lesser ones outside of unlocking other jobs. So characters towards the end of the game start to feel a bit samey. My physical attackers had the same main and sub job, though my magic and support oriented characters were a bit more diverse. In this game, as in many strategy RPGs, terrain properties and elevation play a role in combat. If you’re above an enemy you’ll deal more damage and have a greater chance to hit. Having the high ground also allows archers to shoot farther with their bows. What terrain your character is standing on can effect things like accuracy and evasion, though I often found the difference it makes is negligible. The biggest issue in terms of gameplay is probably how easy it is to become overleveled. Shrines that contain side quests are scattered around the game. Doing these is a good idea, as you get money and unique items. However, if you do, you will find yourself overleveled quickly. Another issue is that towards the end of the game, you’ll probably find a singular strategy that works in almost all situations. For myself, I had two physical attackers I could buff up to absurd levels and take out most normal enemies in one attack. Once I discovered this, my other characters pretty much went to support roles. Even high level magic casters couldn’t do comparable damage. Another issue I had is that the attack animations in this game are sorely lacking. I couldn’t help but draw comparisons to games like Disgaea, and the attacks here just feel flaccid. Even the big super attacks you get towards the end of the game just gives the character a little aura before attacking. It makes the often long battles just seem a bit more bland. I suppose this ties into the visuals of the game in general. The character portraits look really well done. As for the rest of the game, I suppose it’s passable for a Vita game, but definitely looks somewhat out of place on the PS4. The story also has some issues, mostly in just the pacing. For probably the first 60-70% of the story, the goal is just finding Kaguya’s mother. You come across a character, ask them if they’ve seen her, they say they haven’t and you move on. It takes a while for things to really start happening. There’s also a whole host of characters, though very few of them really have much development. Even the kid you see at the beginning, Kintaro, kinda fades away. You never even learn his motivation, he just wanted to help Kaguya for some unknown reason. Kaguya is the main character, and she never really gets beyond wanting to find her mother, and also being caring and kind to random people on the way. The music in this game is fine, and suits the setting and aesthetic of the game, however there’s only one battle theme, and battles can be very, very long at times. About halfway through the game, I started just listening to other things. Speaking of audio, this game is dual audio, so you can enjoy the dub or original Japanese. I tried out both, and the dub seemed quite serviceable to me. I ended up sticking with the dub, mostly because there are no subtitles during animated cutscenes, which seems like a pretty massive oversight. The dialogue also felt a bit stiff and weird at times. Something that kinda bugged me was characters would sometimes refer to each other in the third person, as they were talking to them. If you do pick up this game, a word of warning. I had the game crash on me on multiple occasions. Do yourself a favor and save every chance you can. Aside from that technical problem, God Wars: Future Past doesn’t do anything egregiously wrong. It’s a serviceable SRPG, but it’s not really doing much we haven’t seen before. I don’t think it’s deep enough to satisfy fans of the genre, and there isn’t much meat to the story to chew into. It took me probably about 60-70 hours, and the story is stretched very thin over that length. It’s $50 on the PS4, and $40 on the Vita, and I think the price is a bit steep in both cases. Personally, I think I would’ve preferred the Vita version. Not being tied to a chair might’ve made the battles feel a bit less tedious.